We arrived the Vigan bus terminal at around 5:30 Sunday morning. I didn't quite expect the trip to exceed seven hours. 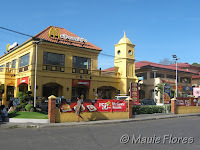 We had around five stop overs and there were drop-offs once we reached Ilocos Sur. The road was smooth from the North Luzon Express Way to La Union. 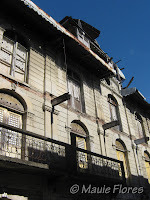 However, some roads were being repaired from Tagudin, Ilocos Sur all the way to Vigan. 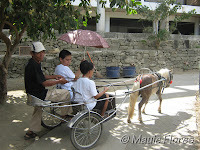 From the Partas Vigan terminal, we got in a tricycle and instructed the driver to go to Grandpa's Inn. 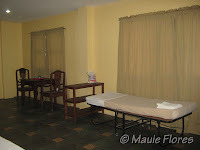 The only available room for us was the Calesa Room at Php 2,580. 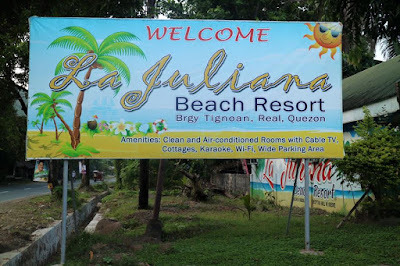 We were informed, however, that we need to add an extra Php 200 for checking in so early even when we told them that we will be checking out around the same time the following day (which was this morning). That turned me off so we got back in the trike and checked out Cordillera Inn where my sister and brother-in-law stayed in April last year. Unfortunately, the place was fully booked. We went to nearby Gordion Hotel instead. 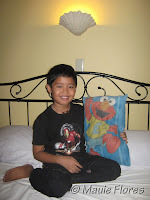 We were lucky to get a Standard Room plus an extra bed for Php 2,325 (Php 1,800 for the room and Php 525 for the additional bed for my brother). Our room, Room 19, was on the third floor of the hotel and that made the rooftop accessible. 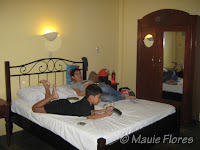 Honestly, the room was big enough to be a Deluxe room if you compare it to most expensive hotels. It had a matrimonial bed big enough for the three of us. A 21" cable TV sat in the corner near the area where my brother's extra bed was set up. 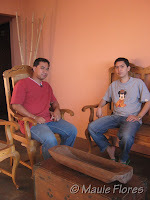 There was a small breakfast table for two by the door and a big aparador near our bed. 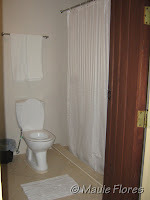 The toilet and shower room was also big although it could have been better if they have installed a bath tub. Our room charge came with complimentary breakfast for us adults. Since we were leaving early for Baguio this morning, the sweet Front Desk Officer offered to serve us our breakfast already. Now that's what I call full customer satisfaction! Two thumbs up for Gordion Hotel and its staff. 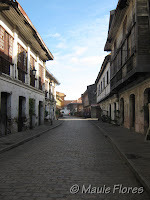 Oh by the way, V. delos Reyes Street, where Gordion Hotel is, is actually just parallel to the famed cobbled stone street of M. Crisologo so it is still accessible to the souvenir and antique shops. 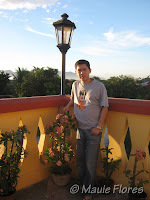 It's also a walking distance away from the cathedral and plaza. 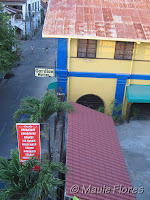 Gordion Hotel is located at V. de los Reyes corner Salcedo Streets, Vigan City. Tel. No. (077) 722-2526 or +639287545905. 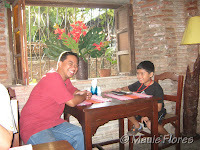 After settling in, we went to the Ruins (Gordion Hotel's dining area) to have breakfast. 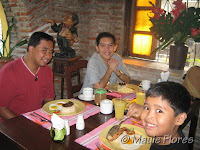 The three of us adults decided to have the Filipino breakfast set meal of Vigan Longganiza, eggs, fried rice, coffee, and fruits. 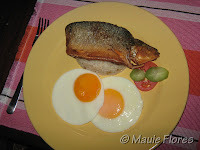 Ralph had the Daing na Bangus meal. I had to pay an extra Php 140 for his meal. It still is cheap considering the big serving. 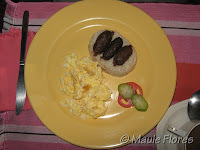 The hotel cafe's Vigan Longganiza was crispy and yummy. 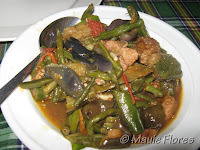 It went so well with the Sukang Iloko (Ilocano vinegar) that was served for dipping. 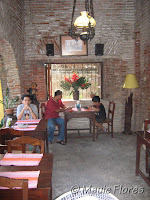 We were not only satisfied with the food but also with the breakfast area's ambiance as well. 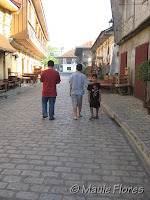 We decided to take a walk along the preserved Calle Crisologo after breakfast. 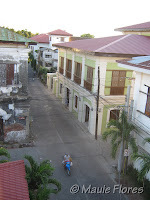 The sun was already rising up but there was still the coolness of Vigan air that made us so enthusiastic to walk around. The shops were still closed when we started to walk along the street towards the St. Paul Cathedral. I truly enjoyed walking the cobbled street with the shops still closed. 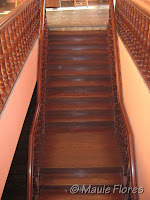 It gave me the authentic feel of walking the streets during the Spanish times. 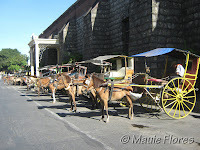 Only calesas (horse-drawn carriages) are allowed to pass by this street but not many tourists know this fact. That morning alone, we already an SUV and a van cruising along Calle Crisologo but the locals were just looking at them like they were crazy. I think the local government should put up more signs for the tourists about this. 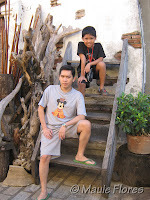 Walking to the end of Calle Crisologo brought us to the Vigan Cathedral or St. Paul Cathedral. 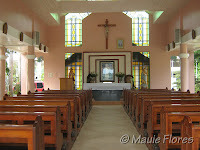 There was a mass going on when we arrived since it was a Sunday so I was not able to take photos of the interior. We wanted to hear mass but the mass was in the vernacular so we just said a silent prayer and went to Plaza Zalcedo which was just accross the street. 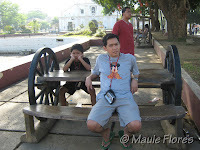 This plaza showcases models of the UNESCO Heritage sites in the world which Vigan is a part of. Sadly, people did not give importance to this place as UNESCO has done and even had some vandals written everywhere, even on the marker itself. 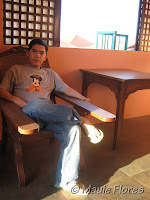 We rested for a while on the wooden tables and benches that were everywhere in the place. Going back to the hotel, we passed by Plaza Burgos which was just by the side of the cathedral. 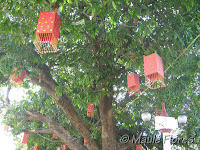 Plaza Burgos is the home of local fast food kiosks selling Ilocano Empanada and Sinanglao (beef broth with beef innards). I initially intended for us to try local street food here but we were still full from the hearty breakfast we had in the hotel. In between Plaza Burgos and St. Paul Cathedral were lines of calesas. 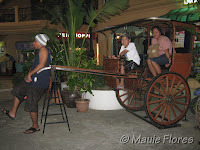 A tourist can go around downtown Vigan riding the calesa for Php 150 an hour but we opted not to. 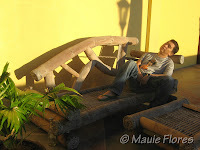 We had to go back to our room around ten o' clock just when the sun's heat began to give me a migraine. 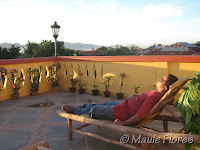 We all agreed that we needed a short nap in the comforts of our airconditioned room. After that, we walked back towards the plaza to find a place where we can have lunch. Ralph wanted so much to eat some Ilocano authentic Bagnet so we just walked past Max's Restaurant. 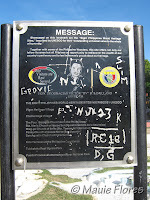 There's a monument of a woman a few steps away from Max's and it's of Leona Florentino, an Ilocana writer. 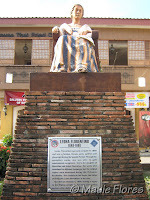 She was born to a wealthy and prominent family in Vigan and is considered as the "Mother of Filipino Women's Literature". In front of her monument is Cafe Leona. The place was full by the time we got inside but we were lucky to find seats after some time. We ordered Bagnet, Pakbet, and a small bowl of soup for Ralph to go with his Bagnet because he wouldn't even try smell the Pakbet because of the bagoong. We also ordered canned juices for each of us. 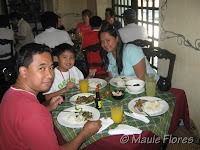 Our total bill was a little over Php 600 which was not bad at all. The food was not that memorable though. I think that the only difference between the restaurant's Pakbet and my own version is that they use Ilocano bagoong while I use alamang. 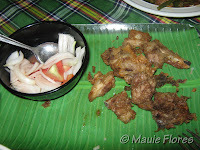 The Bagnet is just like the Lechon Kawali we cook at home. It's just that they use Ilocano bagoong with tomatoes and onions for dipping while we use Mang Tomas. 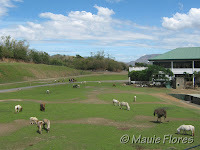 From the plaza, we rode a tricycle that took us to Chavit Singson's Baluarte for Php 60. This part of the trip, for me, is the best. 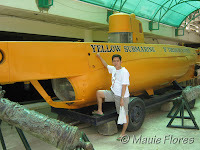 I started to like Chavit Singson for putting up this place and making it available to the public for FREE! Everything is free here, except when you buy souvenirs and have your pictures taken. 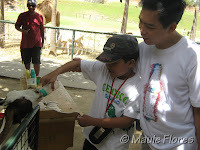 Oh, you also have to pay ten pesos per bottle if you want to feed the kids (the baby goats, I mean). 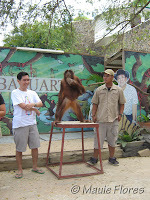 At around 2 p.m., a live animal show was held in the picnic area. 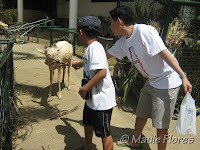 I am glad that my boys gladly volunteered to be part of it. 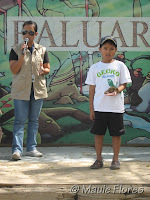 They had the chance to hold the animals while the host gives interesting facts and trivia about them. 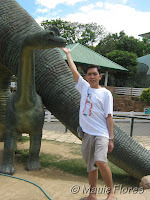 Before going back to our hotel, we had to pass by the string of souvenir shops outside the zoo. 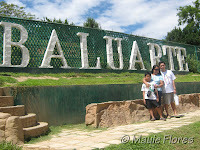 I was able to buy a Baluarte souvenir shirt for Ralph that cost me Php 100. We also had the chance to try some empanada sold by the only empanada store around. We were given the chance to taste one empanada for free (I told you, almost everything here is free) because the super nice empanada vendor discovered that it was our first time in Vigan. Ilocano empanada is so different from the bread empanada that we knew. The vendor told us that the batter was made from rice flour and egg. The batter is fried along with cabbages, eggs, and meat. We had to take the special empanadas I bought home because we already had our fill of our free empanada. 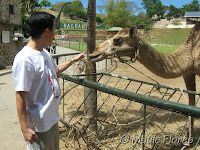 We had the chance to eat it for merienda once we woke up after a short afternoon nap. The empanada's crust was still crisp and not soggy at all after two hours. 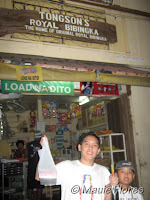 Before going to Vigan, my dad specifically instructed my brother to buy some bibingka. 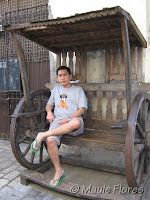 He thought that he was just mistaken and he told me dad that Vigan is known for longganisa and not bibingka. But when we went out for an early evening stroll, we passed by a store in front of Plaza Burgos with the sign that read "Tongson's Royal Bibingka". People were lining up for bibingka! We were given, again, a free taste of the famed royal bibingka and we ended up buying three small boxes (one for us, two for pasalubong). 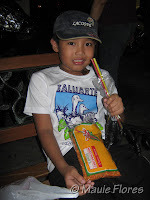 We also bought a bag of cheese flavored chichacorn and Coke so we can munch on something while going around the centro. 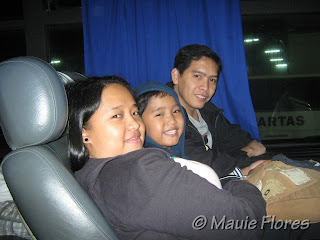 We checked-out of the hotel around four-thirty this morning so we can catch the 5 a.m Partas trip to Baguio. The bus fare was Php 294 and this time I had to pay for Ralph's seat as the bus was the regular airconditioned one. The trip from Vigan to Baguio took us 5 and a half hours and I'm blaming Monday morning traffic in San Fernando, La Union. 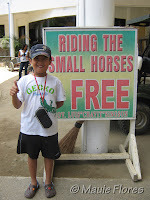 Our stay in Vigan was definitely a short one. We could have gone to the museums if it was longer. 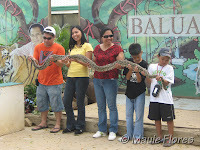 We're planning on coming back soon anyway, probably going to Laoag and Pagudpud from there. 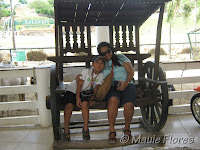 Now that will be one great Ilocos adventure for us! pramis! one day lang talaga. kakapagod lang. Hehehe... ok na rin deal nila ha kasi kasama ang tour at meals. Maganda dun sa Gordion ok ang service.